Thursday's excessive rain in parts of Indiana caused significant flooding in many rural areas, including parts of Lawrence County. 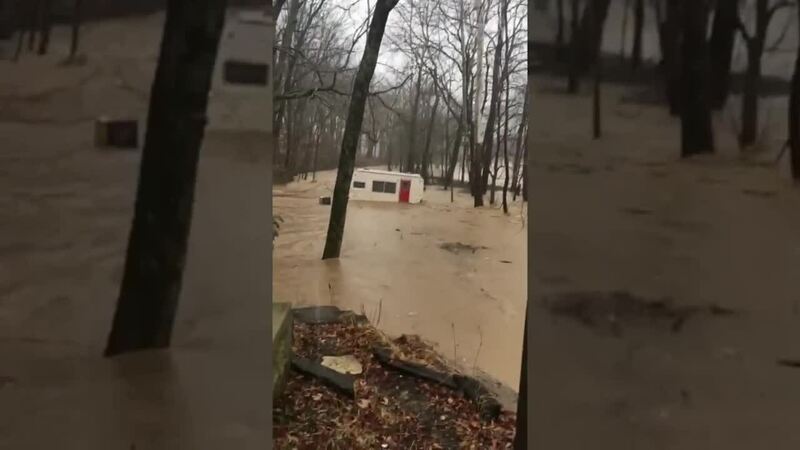 LAWRENCE COUNTY — Thursday's excessive rain in parts of Indiana caused significant flooding in many rural areas, including parts of Lawrence County. The video above, taken by Hannah Lee, shows a camper being swept away in the strong currents of a swelling creek. Lee said the camper, which her family calls "Cami," sat in a field behind the home. She had just called her husband to come home and move it moments before it was swept away in the creek. "The water came so fast!" Lee said. Lee said she saw the water start to gather from the creek around her camper and knew they were in trouble. "I was so sad because we had gotten Cami a few years ago and really fixed her up and our family has so many memories camping in it," Lee said. "But we are fine and the house is fine, so that's all that matters!" For more images from Thursday's flooding around central Indiana click HERE .